Harlequins have signed ex-Ulster and England Under-19 fly-half Brett Herron from Jersey Reds for next season. The 23-year-old joined the island side at the start of this season and has scored six tries and kicked 71 points in the second-tier Championship. "He is a well balanced player whose game management caught our attention," Quins head of rugby Paul Gustard said. The London club have also signed 22-year-old centre Luke Northmore from Cardiff Met University. "It is a great club with an amazing history - but I know Paul Gustard is now looking to create history of his own there by winning more silverware," Northmore said. Herron previously played six Pro 12 games and one Champions Cup tie for Ulster during the 2016-17 season after spending time at Bath as a youngster. 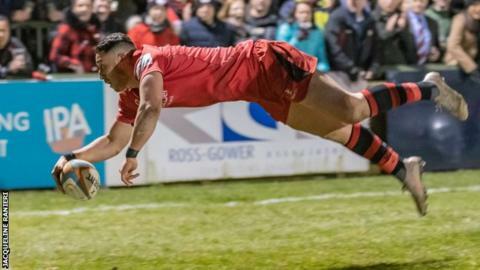 "He has been a key player for Jersey Reds and impressed us with his performance last summer in our pre-season fixture," Gustard told the club website. "He is a well balanced player whose game management caught our attention and he has been progressing nicely in a competitive league."